Writing great content is, well … great. But it is possible to overdo it. Cramming too much text onto one page can not only drive away potential customers, but all your carefully written content can become lost to Google. This is where web content architecture comes into play. Proper web content architecture benefits two parties: your website users and the search engines. Your website visitors are no different than you or me. They want to be able to find what they're looking for quickly without having to peruse your entire site, and their needs should be the first priority when creating your sitemap. Think about where you would look for certain information on a website, and create a sitemap based on that natural flow. The simpler you make it for them, the more likely they are to convert into paying customers ... and the more likely you are to catch Google's attention. The key to successful SEO is optimizing specific pages for specific keywords, even if that means creating new pages to reflect those keywords. Google likes relevant, keyword-rich content, and if you try to accomplish too much on one page (i.e. trying to rank for too many keywords), Google’s not going to understand the purpose of your page and will likely give you a lower ranking in the search results. Effective web content architecture also makes web design a lot easier. Knowing how much (and what type of) content will go on a page can help a designer decide on layout, color schemes, and verbiage found in images. Design and content should always go hand in hand, rather than one determining the other. Our client, John Moore Services, is a great example of using site structure to your advantage. 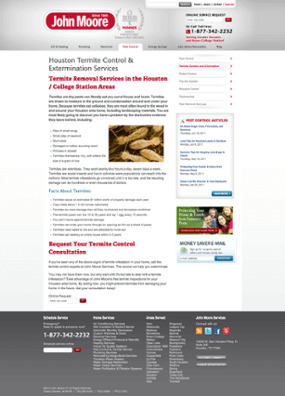 John Moore provides a plethora of home maintenance services to Houston area customers. But rather than summarize all their services on one page (or, equally useless, require visitors to scroll for eternity), they have broken apart their content into sub-pages that describe the specific services they offer. So, for example, underneath the main “Pest Control” page, we have service pages for Mosquitoes, Fire Ants, Termites, Rodents, and more. This way, customers can learn more about specific bug problems they have, and Google can give the site better rankings because of all the relevant content on each individual page. By breaking apart the content into separate pages, our design team was able to choose relevant imagery and layouts to accommodate the content. If you find visitors leaving your site in droves because they can't find what they're looking for, it's time to re-visit your web content architecture. Drop us a line to find out how we can help.